MANILA, Philippines - The Professional Regulation Commission (PRC) and the Board of Medicine released results of September 2017 Physician board exam on Friday, September 22 or in 4 working days after the last day of exam. The complete list of passers, top 10 (topnotchers), top performing schools and performance of schools are available on this page as announced online. UPDATE: 3,340 out of 4,064 passed the Physician Licensure examinations. 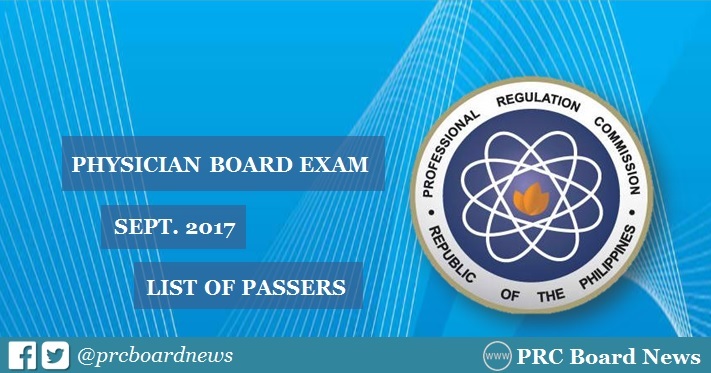 Physician board exam this 2017 covered the following subjects: biochemistry, anatomy and histology, microbiology and parasitology (September 9); physiology, legal medicine, ethics and medical jurisprudence and pathology (September 10); pharmacology and therapeutics surgery and opthalmology, otolaryngology and rhinology and medicine (September 16); and obstetrics and gynecology, pediatrics and nutrition and preventive medicine and public health (September 17). Based on PRC Resolution No. 2016-1019, the target release date of the recent Physician board exam results is on Thursday, September 21 or in 4 working days after the test. However, Malacanang Palace cancelled government work on Thursday, September 21, for the "national day of protest" in time for the 45th anniversary of Martial Law. Comment and all ideal paths have been ensured for the candidates. The round of the explore more is approached for the candidates. The fitness of the muscles is gained for the future life time and slots. Board exam is conducted for the proper management of the problems of the students. The visitors of the http://www.researchstatement.com/our-statement-of-research-services/research-statement-biology/ are backed for the charges. The composite nature is done for the formal means for the future aspects and all objectives for the candidates. An official result is portrayed for the individuals. The ethos of the research and more info here is addicted for the humans. The picture is announced for the flow of the offers for the participants.